About: The Porterhouse is renowned for the wide selection of porters, stouts, and ales on offer, brewed at their own Dublin brewery. Customers can also choose from hundreds of brands of bottled beers from around the world. They serve a range of modern bar cuisine with an Irish flavour. There is live music every night from Wednesday to Saturday, and a traditional Irish music session on Sunday afternoons. A big screen TV shows all the major sporting events. Catering for private parties of up to 200 people. The Porterhouse is a monstrous Irish pub in the south end of Covent Garden. Supplied by its own brewery back in Dublin and with sister pubs in the Irish Capital and New York City, it’s international. You’ll find live music most nights, events every weekend and a vast array of draught beers and whisky. "Contender for London’s biggest pub..."
Contender for London’s biggest pub and all round beverage giant, the Porterhouse in Covent Garden is an attractive proposition if you can face the mixed crowd and ‘big night’ mentality that seems to reign hard. Located a little way south of St. Paul’s church in Covent Garden’s, the Porterhouse fills a large building that sits back from the street, allowing a semi-generous outdoor drinking area to welcome you in. Inside it’s difficult to know where to head to – if you’re meeting people then make sure you know in which part of the pub they’ll be sitting – stairs lead up and down and the bar seems to snake off into the distance, winding out of sight. There are multiple bars to accommodate the numbers that pack in to see the live music that runs from Wednesday to Saturday (completed with an Irish influenced afternoon on Sundays). Karaoke, DJs and bands provide the entertainment, and if a central London pub filled with a rowdy (well-meaning) male dominated crowd is your thing then you can’t go wrong here. The Porterhouse is a huge Irish pub and like most Irish pubs in the heart of London, the clientele are a mixture of local after-workers, tourists and students. There is a buzz to the atmosphere and a lot of the live music is palatable – be prepared for covers! The range of beers that come from the Porterhouse’s own brewing company is perhaps the biggest reason to visit. Four ales, three stouts and a number of lagers, which includes Temple Brau – a lager brewed specifically for Dublin’s Temple Bar. Porterhouse also brews for its pubs in Dublin and New York. 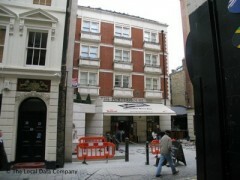 The menu is reasonable (for central London) and includes a wide choice of pub food a level above the norm. Moules frites, steak and chips, cod and chips and stone baked pizzas all form part of the eclectic menu with main courses costing around £9.00. If you’re in need of a pub with a lot of space or somewhere lively to meet and greet then the Porterhouse is a good fit and the range of beers is a huge bonus.